Each well is individually designed to match conditions found during the well drilling process. Common design factors are high iron/manganese content, connate water, seawater intrusion, and elevated nitrates from outdated farming practices or septic systems. In some areas groundwater is “pristine” water that exceeds the United States Environmental Protection Agency (USEPA) drinking water standards. 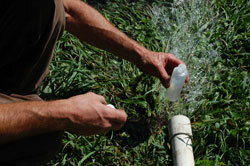 Certain areas have groundwater that requires treatment to meet USEPA standards.